When users want to use Content Station, Smart Connection or any other application that is based on Enterprise, they need to log in to Enterprise Server first. Each user therefore needs to have a user account set up in Enterprise. Users are given access to files per Brand by making them part of a user group and subsequently assigning this group to one or more Brands. Users must therefore belong to at least one user group, but they can also belong to multiple groups. 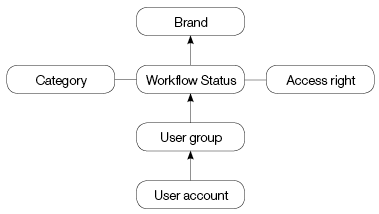 When a user group is assigned to a Brand, it needs to be accompanied by a set of Access Rights which in itself is linked to one or all Categories and one or all Workflow statuses of that Brand. This way, users can be allowed or denied to perform specific tasks on files, depending on the Workflow status of the file and the Category that the file belongs to. The combination of a user group, Category, Workflow Status and Access Profile is known as an 'Authorization Rule'. Note: Access Rights are also used for allowing or denying users to use specific features of an application, such as the ability to use the Publication Overview application in Content Station, the ability to apply styles in InDesign, and so on. Figure: In order for a user to have access to a file in a Brand, a user account needs to be created for that user and made part of a user group. The user group is added to a Brand by linking it to a combination of Category, Workflow Status and Access right. Example: User A belonging to user group A might be allowed to edit or delete files from a particular Brand, while user B belonging to user group B might not be allowed to do so. Note: Users’ full names, log-in names, and user group names must all be mutually exclusive (meaning: you cannot use a name for a user group if that name is already used for a user account). Enterprise will warn you if you try to create users with the same name as a user group or vice versa. You may want to plan in advance how to name your users and/or user groups.